During the month of January the elementary students will be learning about the character trait of fairness during their guidance lessons. They will be learning that fairness means treating other people the way that you want to be treated. 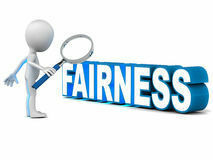 When you are fair you are impartial and honest. You make decisions that are free from bias, prejudice, favoritism, or self-interest (What's in it for me). You follow established rules and you don't cheat. Your family, friends, and teachers know that they can count on and trust you to do what you say you will do. They will also be learning that fair doesn't always mean that everything is equal or the same. For example: Some people wear glasses and some do not. If fair means equal, would it be okay to say that no one should wear glasses because it isn't fair if some have them and some do not? By asking questions like this we hope to show students that "fair" does not always mean "equal" and to challenge their thinking about the concepts of fairness and that of equality. We will be talking about how equality isn't about sameness but rather access, rights, and opportunity. We will be talking about how every person is unique, and that all people should be able to reach their full potential without encountering artificial barriers of gender, race, religion, class or cultural barriers. F - Find ways to share, take turns, and feel less jealous. A - Ask people what you can do to help make things more fair. I - Include others in games and activities. Don't leave people out. R - Respect people who are different from you. As parents, you can help us reinforce our January character trait by talking with your child about fairness this month at the dinner table at home.